Clarification regarding UGC approval UGC Recently Remove 4300 Journal on 02/05/2018. In this list IJCRT is also removed. UGC already Put Notification on website The UGC would also like to clarify that 4,305 journals which have been removed on 2nd May, 2018 were UGC-approved journals till that date and, as such, articles published/accepted in them prior to 2nd May 2018 by applicants for recruitment/promotion may be considered and given points accordingly by universities. ISSN Approved and 5.97 Impact Factor Journal. Impact Factor : 5.97 | ISSN Approved | Removed old Journal Number By UGC 49023. ISSN Approved and 5.97 Impact Factor. 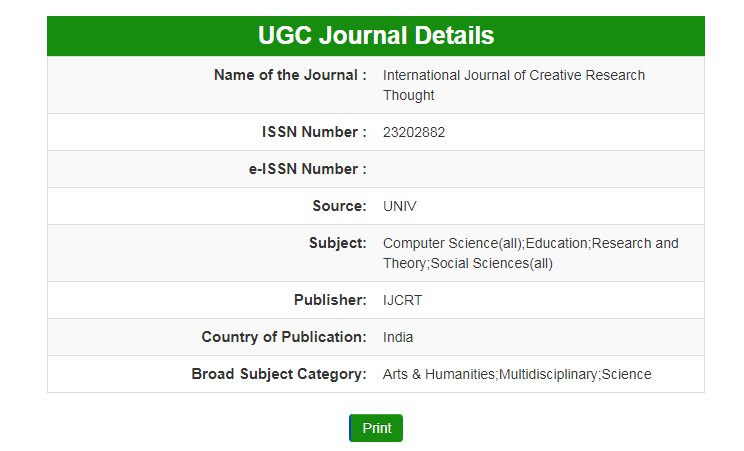 The International Journal of Creative Research Thoughts (IJCRT) aims to explore advances in research pertaining to applied, theoretical and experimental Technological studies. The goal is to promote scientific information interchange between researchers, developers, engineers, students, and practitioners working in and around the world. ISSN: 2320-2882 | Impact Factor: 5.97 | Impact Factor: 5.97 and ISSN Approved. Impact Factor: 5.97 and ISSN approved. Notification of Review Result -	Within 02-03 Days. 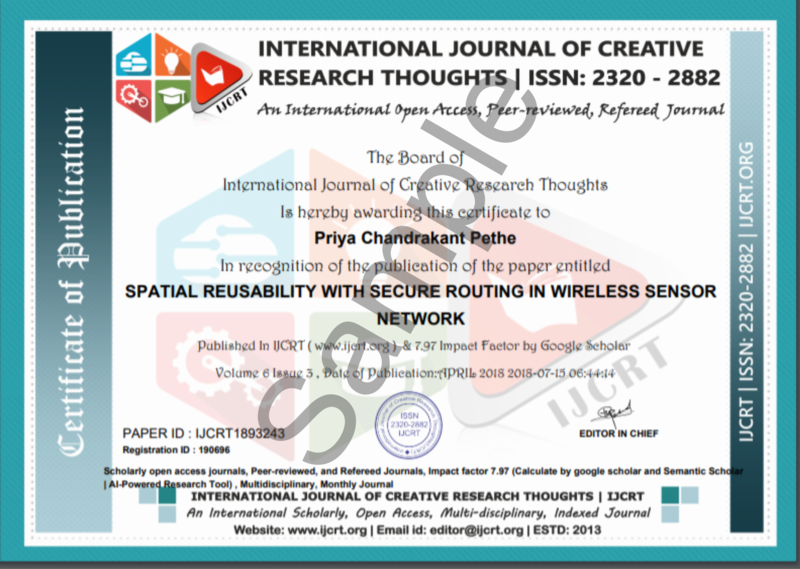 Publication of Paper -	Within 02-05 Days. ISSN: 2320-2882 | Impact Factor: 5.97 and ISSN Approved. DOI and HARD copy of certificate Provide. You can Submit your paper any time no deadline for paper submission. Review Results (Acceptance/Rejection) Notification: Within 02-04 Days. Paper Publish: Within 02-04 Days after submitting all the required documents. Provide A Free digital object identifier (DOI) Like our Facebook Page and free DOI. Provice the Mail and SMS notification to the author for each stage of the paper publication procedure. Prestigious Reviewers from Well-known Institutes/Universities among the world. Provided Hard Copy of Certificate on Request based only additional charges. provide author research guidelines & support by mail, SMS and the call. Indexing of paper in all major online journal databases like Google Scholar, ResearcherID Thomson Reuters Indexing, Mendeley : reference manager, Academia.edu, arXiv.org : cornell university library, Thomson Reuters, Research Gate, CiteSeerX, DOAJ : Directory of Open Access Journals, DRJI, DocStoc, GetCited,Base,ISEDN, Wiki CFP, Index Copernicus International, Cabell's Directory, Open J Gate, ISSUU, Scribd, ASI : Advance Science Indexing, RefSeek, Utem. 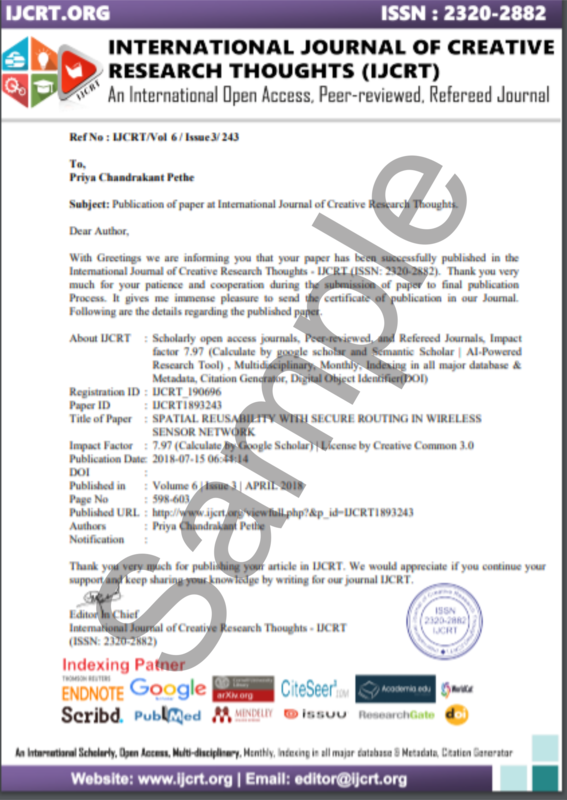 Authors can communicate any time to IJCRT through mail - editor@ijcrt.org If author have paper registration ID then kindly mention it in the subject field of the mail. Providing A Free digital object identifier by DOI.one How to get DOI? 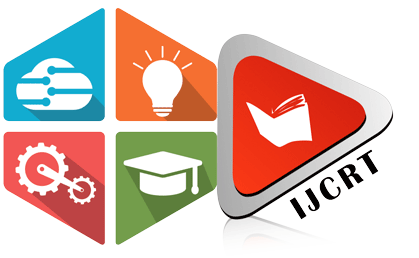 IJCRT RMS | Earn 500 Per Paper. International Peer Reviewed, Open Access Journal | Impact Factor: 5.97 | Impact Factor: 5.97 and ISSN Approved.